The Buddha, his life and teachings, have been an inspiration to artists in many countries all through the ages. Korea is no exception. An appreciation of Korean culture is incomplete without an understanding of Buddhism's role in the development of the Korean arts. For Korean Buddhist art is everywhere evident throughout the long history of the peninsula. 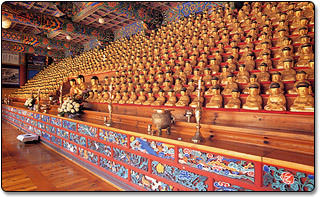 Over half of the nation's 230 National Treasures are Buddhist: At least 37 statues, stone Buddhas and rock reliefs, 25 pagodas, 14 buildings, 15 stupas and lanterns, bells, several paintings and several copies of Sutras, including the huge set of the Tripitaka wood-blocks at Haein-sa Temple. 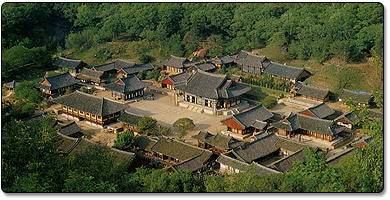 Nearly half of Korea's 848 officially designated treasures are Buddhist too. And the lists continue on through national, regional and local cultural properties; new discoveries are frequently being made. There would have been much more if it were not for the ravages of invasion and the greed of foreign collectors. Numerous works of Korean Buddhist art can be found in Japanese and in Western Collections. 1. Inclusiveness - the ability of Buddhism to absorb different influences. This can be seen in the variety of cultures and philosophies absorbed into Korean Buddhist Art: Theravada, Mahayana, Tantric, Shamanism and Confucianism. 2. Interrelatedness - the combining of several arts to portray its true beauty; the Monk's Dance "Sung-mu" demonstrates a performing art which is a combination of music, dance, embroidery and costume. 3. Interdependence - the relationship of the parts to the whole and of the whole to the parts. All Korean temples are built without nails so that they can be dismantled and moved to new locations, a true example of interdependence. Like these principles, Buddhist values are also prominent in Korean Art. From the art of making paper lotus lanterns for the Buddha's Birthday to building a temple complex, most Buddhist arts combine such values as patience, perseverance and perfection, all absorbed during the lengthy training period. The student is encouraged to use natural products and to do everything by hand. For, he is not only learning the art or craft but he is also practicing Buddhism as he studies. Now that these traditional values are declining, however, monks and laity are reviving many ancient Buddhist arts and craft, such as paper-making, bookbinding and the traditional tea ceremonies. All Buddhist Art also delivers a philosophical message. 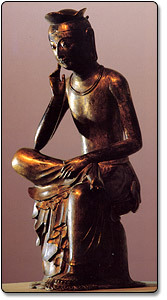 The Buddhas, usually depicted in teaching or meditating pose, represent the potential human perfection within all of us. The Bodhisattvas represent, depending on the level of the follower's development, either a spiritual being to turn to in times of crisis or the latent ability in all of us to aid others in times of distress. The temple in general, represents a place of peace, tranquillity and perfection, a source of inspiration on our spiritual path.